Active layer thickness (ALT) is a critical parameter for monitoring the status of permafrost that is typically measured at specific locations using probing, in situ temperature sensors, or other ground-based observations. The thickness of the active layer is the average annual thaw depth, in permafrost areas, due to solar heating of the surface. This data set includes the mean Remotely Sensed Active Layer Thickness (ReSALT) over years 1992 to 2000 for an area near Prudhoe Bay, Alaska. The data were produced by an Interferometric Synthetic Aperture Radar (InSAR) technique that measures seasonal surface subsidence and infers ALT. ReSALT estimates were validated by comparison with ground-based ALT measurements at multiple sites. These results indicate remote sensing techniques based on InSAR could be an effective way to measure and monitor ALT over large areas on the Arctic coastal plain. These data provide gridded (100-m) estimates of active layer thickness (cm; ALT), seasonal subsidence (cm) and subsidence trend (mm/yr), as well as calculated uncertainty in each of these parameters. This data set was developed in support of NASA's Arctic-Boreal Vulnerability Experiment (ABoVE) field campaign. The data are presented in one netCDF (*.nc) file. Figure 1: The remotely sensed seasonal subsidence (a) and associated uncertainty (b) for the Prudhoe Bay, Alaska region (from Fig. 8 in Liu et al. 2012). Investigators: Lin Liu, Kevin Schaefer (Kevin.Schaefer@nsidc.org), Albert Chen, Alessio Gusmeroli, Elchin Jafarov, Santosh Panda, Andrew Parsekian, Tim Schaefer, Howard A. Zebker, and Tingjun Zhang. Data are presented in one netCDF file (*.nc). Grid cells with no data (fill value or missing values) are represented by “-999”. One companion file is provided: a vector polygon representation of the gridded data in ASCII text (*.txt) format that contains the same data as the netCDF file. Grid cells at 100-m resolution. The input InSAR data were collected between 1992-01-01 and 2000-12-31. The data represent one time-averaged estimate of ALT from 1992-2000. ReSALT_prudhoe.txt companion file Same data as above in vector polygon format. Active layer thickness (ALT) is a critical parameter for monitoring the status of permafrost that is typically measured at specific locations using probing, in situ temperature sensors, or other ground-based observations. Remote sensing offers the possibility of measuring ALT over large, inaccessible areas to complement in situ measurements. As an alternative and complementary method to ground-based measurements, remote sensing of ALT using InSAR could be particularly useful for filling the spatial gaps of in situ measurements in remote permafrost areas and to advance our understanding of changes in the active layer and permafrost system. The investigators included estimates of uncertainty for each data product. Sources of uncertainty include: spatial variation in the in situ probe active layer thickness (ALT) data and spatial representation error. The InSAR-estimated ALT and the in situ ALT measurements generally agree within the observed uncertainty. The investigators estimated the 1992–2000 average active layer thickness (ALT) with uncertainty for an 80 km x100 km study area of continuous permafrost on the North Slope of Alaska near Prudhoe Bay. They first applied the InSAR technique to European Remote-Sensing Satellite-1/2 synthetic aperture radar (SAR) data to measure the surface subsidence and then estimated the mean maximum thawing subsidence during 1992-2000. They used the observed ground thermal condition to constrain a model of thaw-season subsidence, which improved on a simpler model used by Liu et al. (2010). Assuming fully saturated soil, they used a retrieval algorithm to estimate the 1992– 2000 average ALT from the InSAR-derived subsidence. In the retrieval algorithm, the vertical distribution of water within the soil column depended on soil porosity, which in turn depended on soil texture and organic matter. They estimated ALT uncertainty, accounting for the uncertainty in the remotely sensed subsidence and in the parameters used in the retrieval algorithm. Finally, estimated ALT values were compared with in situ measurements at several sites within the study area. See Liu et al. (2012) for additional details. Liu, L., T. Zhang, and J. Wahr. 2010. 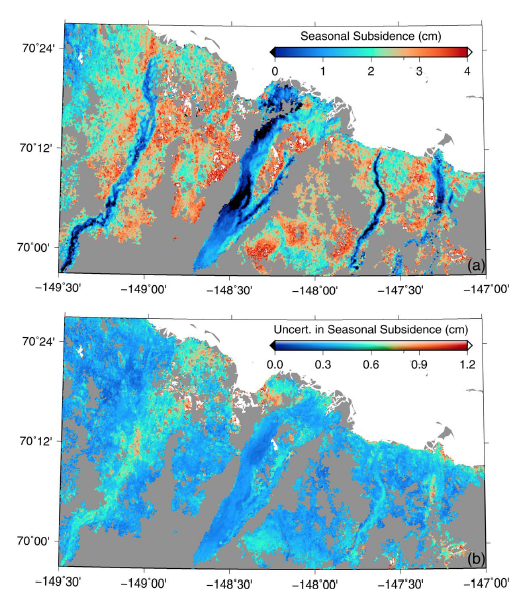 InSAR measurements of surface deformation over permafrost on the North Slope of Alaska, J. Geophys. Res., 115, F03023, doi:10.1029/2009JF001547. Liu, L., K. Schaefer, T. Zhang, and J. Wahr. 2012. Estimating 1992–2000 average active layer thickness on the Alaskan North Slope from remotely sensed surface subsidence, J. Geophys. Res., 117, F01005, doi:10.1029/2011JF002041.